Dyspozytor is returning to Poland from a soujurn in the UK. 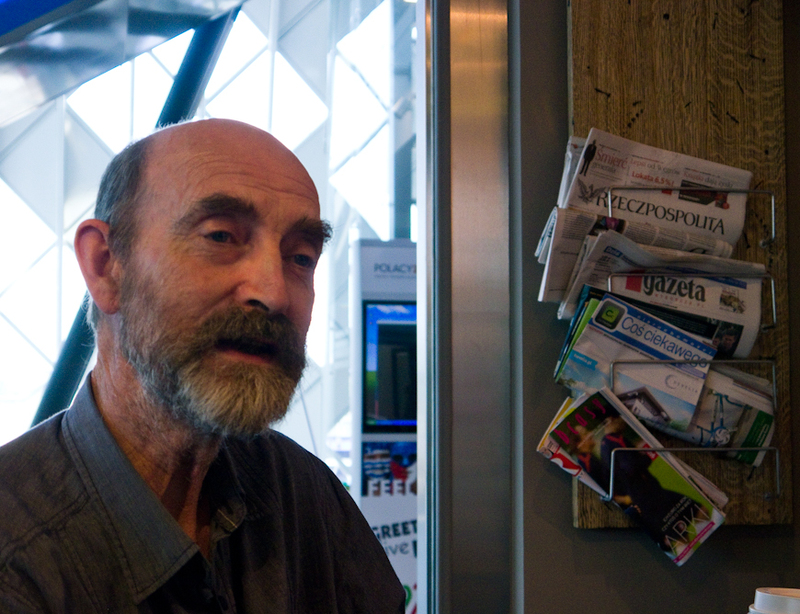 He has reached Poznan Glowny on the eve of the Ireland v. Italy game, and is about to catch the 15:55 to Lodz Kaliska. The main indicator board. Photo BTWT. It is 15:15, the 15:55 has not yet been posted. 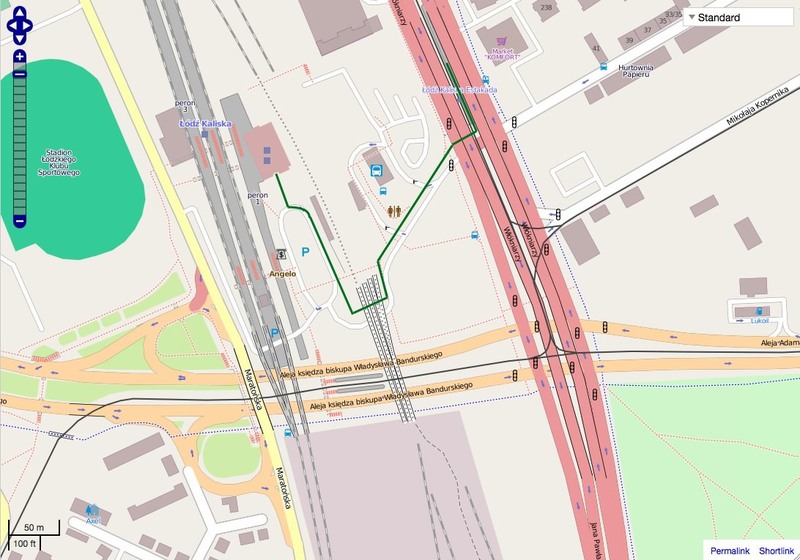 When it appears, some 10 minutes later, it will be shown as terminating at Krakow Plaszow and calling at Konin and Kutno. There will be no indication that it stops at 15 other intermediate stations including Lodz Kaliska and Krakow Glowny! Time for a break. Photo BTWT. Some things in Poland never change. The cleaner talks to the security guard for over half an hour. The brand new lift goes to… who knows? Perhaps they are standing there to advise football fans looking for the lift to platform 2? Stairway to heaven. Photo BTWT. No doubt at all that these are stairs down to platform 2. The escalator only goes up. The 15:55 has been posted, but I need to use my iPhone to access the TK Telekom on-line timetable to confirm that TLK83106 also calls at Lodz Kaliska. BTWT reaches parts other media never get to. Photo BTWT. This is the sight that greets passengers coming out of the lift. It looks as the team who built the new station took little heed of the design of the existing bridge. Note also the ‘hidden’ bay platforms with absolutely no signage. Alfred Hitchcock would have loved this station. Photo BTWT. I turn around and see lots of trains, but the space under the concourse is dark and threatening. Those spindly single track steps are not a fire escape, but the only stairs down to platform 3. Similar narrow steps link the concourse area to platforms 1 and 2. 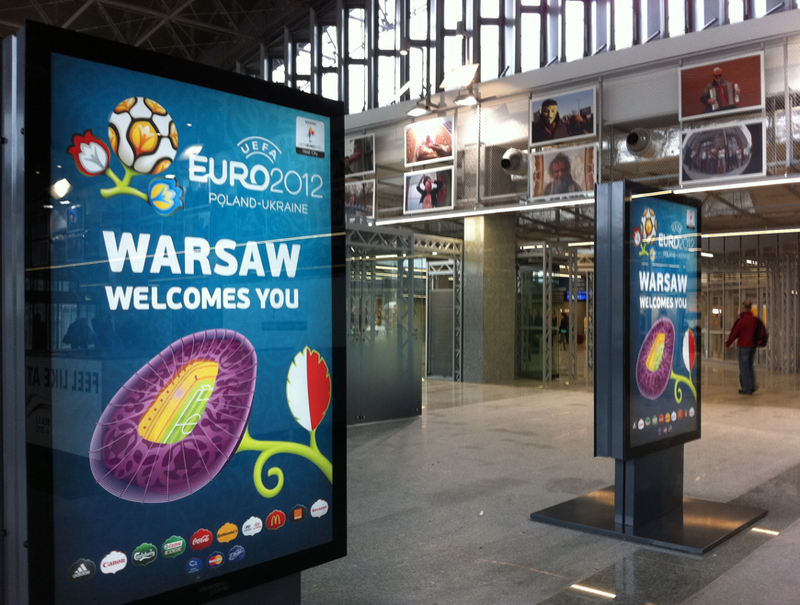 Dyspozytor lands in Poznan on the eve of the Ireland v. Italy game. He is pleasantly surprised by the welcome awaiting the Irish fans. Recently returned after a rail journey from Moscow to Beijing, Andrew preferred the plane to the train for his trip out from Poznan to Moscow. Photo BTWT. Monday begins badly. I am not an early bird and I was not happy when, two days before my departure from the UK, I received an e-mail from Wizzair telling me to turn up at Luton Airport three hours before the my scheduled departure time. I crawl out of bed at 04:00, shower and eat a one sandwich breakfast. At 05:10, I leave St Albans for what should be a 20 minute car journey to the airport. Millions have been spent on making the airport approach road a dual carriageway. Just after it was completed, the airport (run by TBI plc) abolished the its drop-off point conveniently close to the terminal building and routed all incoming cars through a car park and a single ticket barrier. It is not yet 06:00, and already the queue of cars slowly crawling forward is tailing two miles back. Has anyone calculated the social cost of the decision to impose a minimum £1 charge on all cars entering the airport? Luton airport has become my own personal bête noire as far as making passengers walk unnecessary miles. The new drop-off point is now at least 100 yards away from the terminal entrance. It is raining. My suitcase handle is a good 4 inches too short to be comfortable, and my back is already sore after a restless night on a soft bed. It is 06:05. Halfway through the terminal there is a security cordon where boarding cards are checked. I am told to proceed to security zone six – another 50 yards walk back in the direction that I have just come from. Security zone six turns out to be a fast track security check for passengers like myself who turn up at Luton with less than the advised 3 hours before departure. The queue is short and moves quickly. My baggage clears X-ray without a hitch, but I manage to ring the warning buzzer in the magnetic scanning machine and I am treated to a pat down. Another 100 yard walk and I reach a small lounge fitted with departure monitors and chairs. What should I do? Do I wait here, reasonably close to Gates 1 through to 19, or do I walk some distance to the main departure lounge which is conveniently close for Gates 20 to 26? I check the monitor, it is 06:20, my flight is not yet shown. I see that various Wizzair flights are due to depart from both clusters of gates, so I decide to stay where I am. I eat my other sandwich and settle down to read my book, a biography of Richard Trevithic. The book is destined to help me combat boredom during many long hours this day, but as yet I am oblivious of what lies ahead. 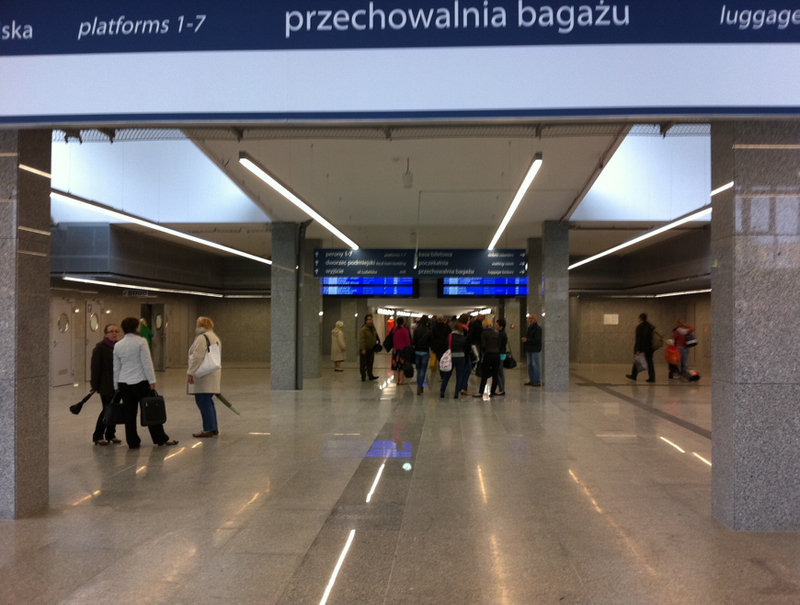 The new above-the-tracks concourse at Poznan Glowny. A further segment of the concourse is under construction beyond the screen on the east side. 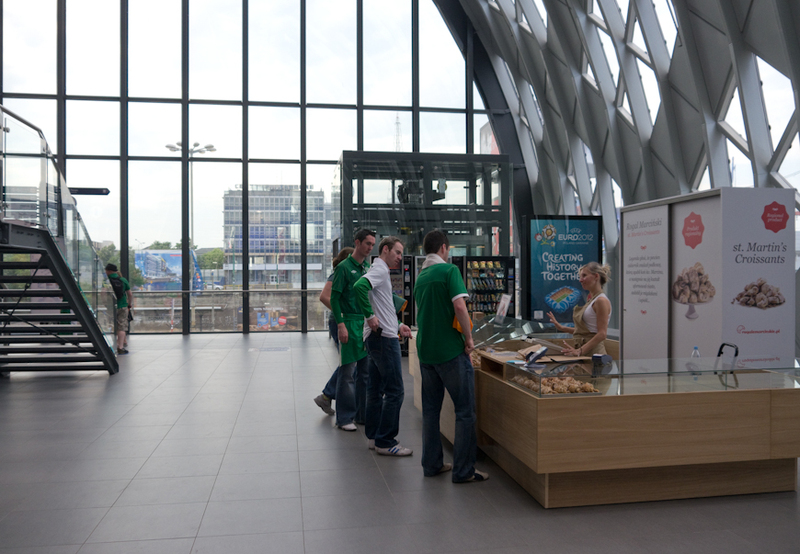 The concourse currently provides access to the new platforms 1, 2 and 3. Will the extension provide access to a further platform 4? Photo BTWT. Shortly after 07:00 my flight, the 08:05 to Poznan, is posted. Check in is at Gate 25, which turns out to be a 500 yard walk from my lounge. By the time I have limped to the gate, there are already about 100 passengers in the queue ahead of me. I ask a couple of football fans to save my place and gratefully sink in to one of the chairs. The queue moves again, I regain my place. Another corridor, a long flight of steps… someone helps me with my suitcase up the steps to the aircraft, I collapse gratefully into a free seat in the last row. I reflect wryly on the difference between the way that Victorian railway companies looked after their passengers and the operators at Luton. Whenever possible through coaches were detached from main line trains and attached to branch line services, to reduce the number of changes. This enlightened practice continued on BR till the 1960s. When it was not possible to provide through coaches, the railway companies tried to arrange same platform connections. Patriotic colours. Plenty of places for a coffee and a quick snack, but not much else. 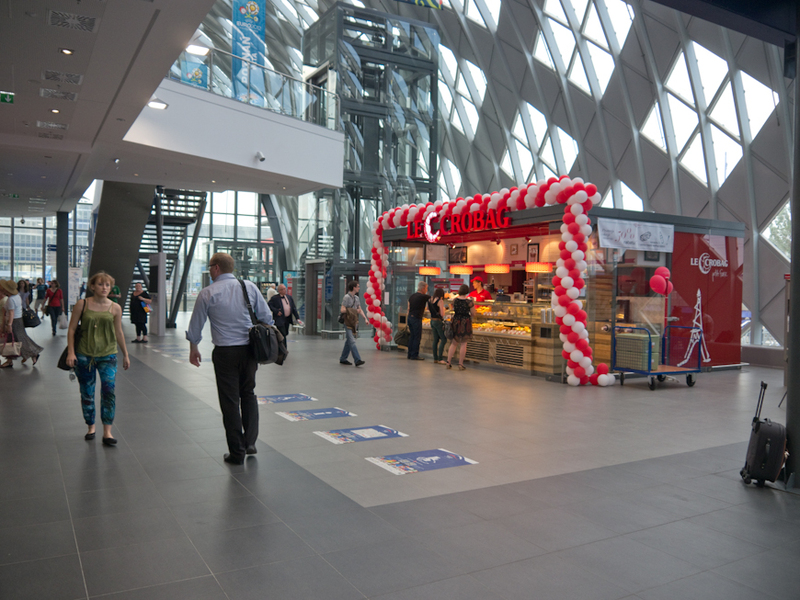 PKP have not yet understood the retail potential of their main stations. Photo BTWT. I am not impressed by the flight attendants who spend most of the flight chatting up a senior colleague and ignoring passengers. The absence of any customer service ethos still seems to linger as a characteristic of many large ‘Eastern block’ companies. We land in Poznan just before 11:00. I walk cautiously down the steps and am delighted to see a bus waiting at the bottom. This drops me a few yards from passport control. Wonderful! The border authorities have opened more booths to deal with the influx of football fans, but not all have been fitted up with computer terminals. The border official writes down my passport number on a sheet of paper and and waves me through. It only takes a minute. 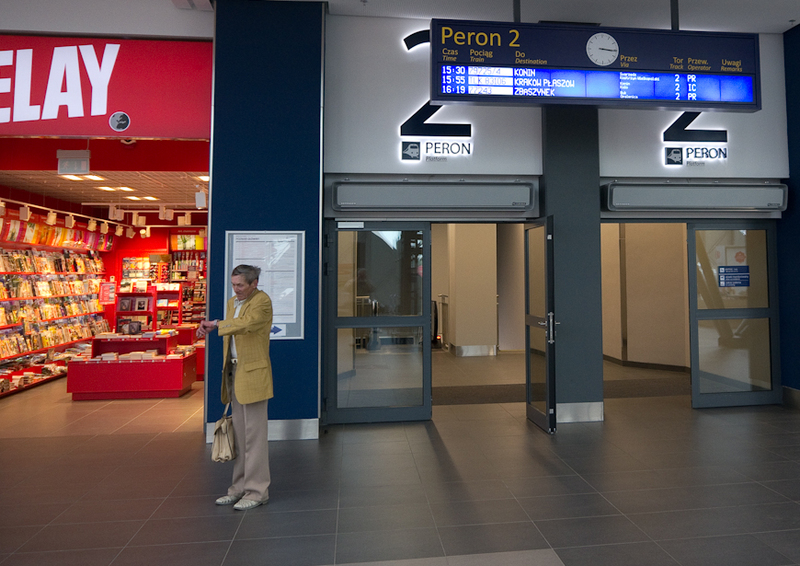 I walk the short distance across the baggage reclaim area and I am in the arrivals hall… another 20 yards and I reach at the bus stop for route ‘L’, the Poznan Glowny shuttle. I award Poznan airport the BTWT award for the most user-friendly airport access that I’ve come across. More surprises on the bus. There is a ticket machine, but it has run out of small change and can only issue tickets for the exact money. The driver is also selling tickets, but by the time I reach him, all the right tickets have gone. The last time this happened to me here, I was overcharged by three times the going rate! This time, the bus driver smiles, rattles about in his till and changes my 5 zloty coin for the right change to put in the machine. Goodness! What has happened to the legendary rudeness of Polish bus drivers? Am I dreaming? I enter into the spirit of things and answer lots of questions from Ireland supporters. I advise them to travel all the way to the railway station where there will be an information desk and possibly maps showing the way to the football stadium. 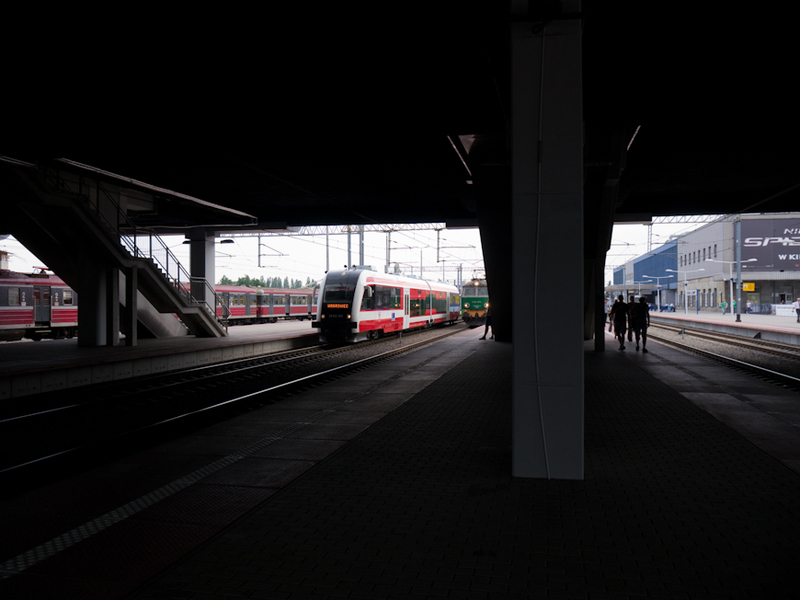 Does the architect of the new Poznan railway station ever travel by train? Seating for passengers does not seem to have a high priority. Photo BTWT. Will the bus stop next to the new station building? No, The bus stops where it always has, just short of the old railway station. I am determined to try out the new building. There does not seem to be a grand entrance. Perhaps it has been built yet? But there do seem to be stairs going up into the building from the platform level. Hurrah, there are escalators. It is going to be a good today after all! The concourse area is quite stunning. It is light and airy and deliciously cool. It was uncomfortably hot outside. A number of Ireland supporters are milling about inside. I decide that the first thing to do is to get my ticket for the journey to Lodz. As always, when buying a ticket in Poland is important to have planned your journey first. I am tired and I do not fancy jumping off and on to trains or dragging my suitcase up-and-down subways. There are only two direct trains the 12:45 Regio osobowy (all stations stopping train) which takes 4 hours 38 minutes and the 15:55 TLK which takes 3 hours 29 minutes. Reluctantly I decided that a journey involving a change of trains – the 14:25 Galczynski, and the 16:52 Doker from Kutno – total journey time 3 hours 59 minutes – is probably my best bet. ‘st. Martin’s Croissants’ – oh dear! Luckily the Ireland fans seem to have eyes for things other than the bad spelling. Photo BTWT. There is no queue at the ticket counters. The old station is still in commission and I suspect is still used by most of the regular rail travellers. I choose a PR counter because the lady ticket clerk looks efficient, and ask for a ticket for a journey on the 14:25 TLK to Kutno and then by the 16:52 TLK from Kutno to Lodz Kaliska. I am told that all seats on this train have to be reserved and that this entails a small extra charge. No worries, at least this guarantees me a seat. Reservation on certain TLK train was introduced a month ago by Transport Minister Novak to ensure that scenes of people squashing on to packed trains via open windows do not occur during Euro 2012. The lady looks puzzled, Booking for this train is blocked, I can’t seem to be able to sell you a ticket. Odd! Ireland is playing Italy in Poznan this evening, so why should an afternoon train running from Poznan to Warsaw be sold out? Since long before the championships, I have kept hearing rumours that tickets for certain trains were unavailable for direct purchase from PKP, but had been reserved for the handful of agencies operating the Poland Ticket scheme. I begin to wonder if any PKP directors are financially involved in any of the Poland Ticket agencies… I decide to take the later through train and buy a ticket for the 15:55 Sukiennice which will take me direct to Lodz Kaliska. Two coffee shops and a couple of snack stands – still room for improvement before catching up with the gastronomic standard of the Gare de Lyon. Photo BTWT. I have some three hours before my train departs to Lodz. I have arranged to meet up with my good friend Andrew, who has just returned from an epic train journey from Moscow to Beijing. I want to hear all about his travels and beg him to write an account of his adventures for BTWT. Much to my delight he agrees. Andrew minds my luggage while I climb painfully to the third floor press office to collect my Euro 2012 press pack. I am hoping to get lots of hard facts about the various improvements that have been carried out to ready Poland’s railways for the influx of football supporters, but the pack turns not to contain the information I am looking for. For some reason my iPhone has not automatically reset itself to CET and suddenly I find myself with less than 30 minutes to go before my train departs. We say a quick farewell and I collect my things for my journey to Lodz. Little do I know that my adventures are about to begin! 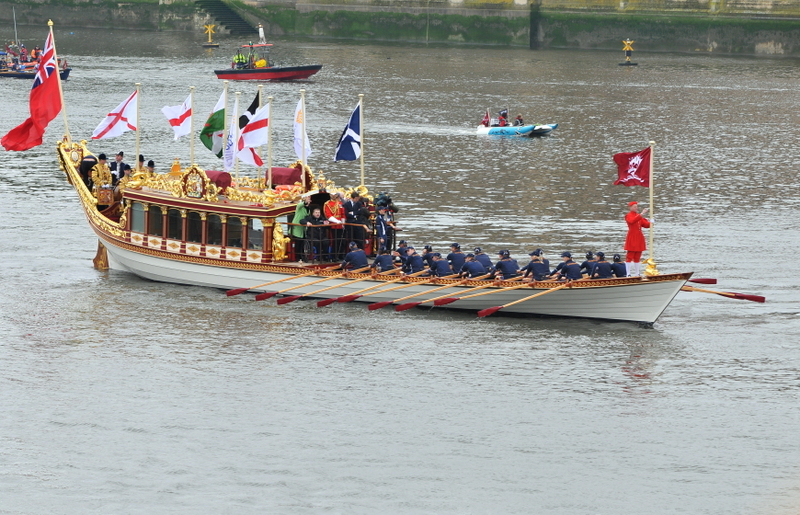 Gloriana during the Diamond Jubilee Pageant. Photo tonylanciabeta. Much to our delight Mark Judd got the full 6 marks that were there to be scored from the first BTWT Brain-twister. The Royal vessel was the Gloriana a royal barge built by master boat-builder Mark Edwards for the Royal Jubilee River Pageant. Mark Edwards is a Cornishman. The Gloriana flew, amongst others, St Piran’s flag, the flag of Cornwall. St Piran was a 6th century Cornish abbot. The historic steam locomotive was Richard Trevithic’s engine built for the Pen-y-Darren tramroad, the world’s first railway locomotive. Trevithic was a famous Cornish engineer who pioneered the use of ‘strong steam’ (high pressure steam) and left behind a string of inventions, but died in poverty. The Trevithic window in Westminster Abbey depicts St Prinan, the patron saint of Cornwall with the head of Trevithic. And for our next brain-twister. What links two of Poland’s newest underground stations with a 15th century confirmation of a union between two nations? I have escaped to the UK to avoid the worst of Euro 2012, so please forgive the rather intermittent postings of late. Nearly 8 years ago, I spent a week with some acquaintances in Kudowa Zdroj. While my friends went off for their daily hike across the magnificent hills that surround this old spa town, I set off to get some much needed therapy for my bad back and sciatica. The treatment centre was located in the town park next to the historic spa buildings. All had recently been refurbished thanks to an EU-funded restoration project. Paths, which a year earlier had consisted of broken and cracked tarmac, had been beautifully relaid with cobble stones. They looked magnificent. Unfortunately they had been finished with a sharp unpolished surface. They were bad enough to walk on and would have been all but impossible to negotiate with a wheelchair. 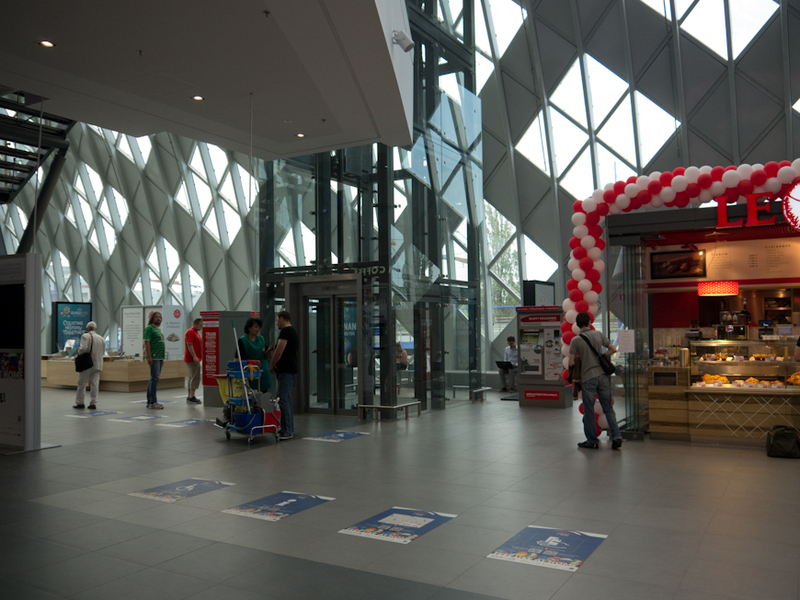 The centre itself was bright with new white paint a fresh sky blue signage. How thoughtful! 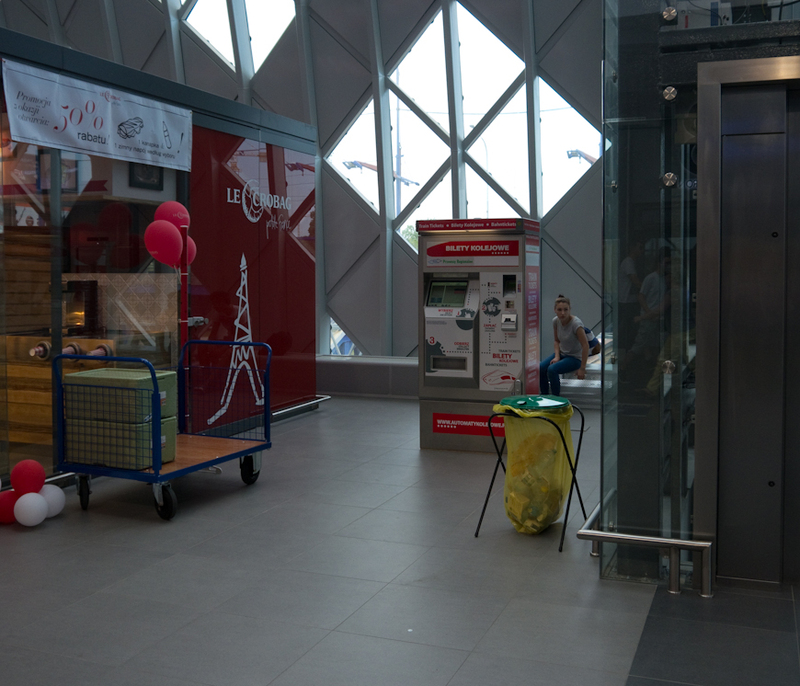 The most prominent of the brand new EU-funded signs was mounted above the lift door, Winda nieczynna (Lift out of order). So the facilities for disabled visitors were all on the ground floor, excellent! I approached the reception desk, I’d like to book some therapy sessions. I feel like lying in a bath with lots of healing bubbles and possibly some massage with a beautiful nurse. The receptionist looked at me oddly and informed me that I would have to see a doctor who would prescribe the appropriate treatment. Just tell me where, I said. On the first floor, but he’s not there now. It’s a Saturday. I manage to get bookings for two two bubble bath sessions. Both took place on the first floor! It gradually dawned on me that the raison d’être of the whole system is not to compete with other spas who treat private patients who are genuinely ill, but to provide a state-funded holiday to patients who are well, and know the ropes how to get favours from their GP. I am never coming back to Kudow Zdroj. Until Poland’s spas learn the meaning of customer service, they will be never be competitive with those in other countries, nor attract the foreign business which their expensive EU-assisted projects were supposed to help them gain. Wschodnia looking smarter than it has ever been. Photo BTWT. And so on to Euro 2012. On the plus side, Poland has gained an impressive list of infrastructure improvements which would have taken years to construct had it not been for Poland being co-host of the championships. Just look at these before and after photographs on Sfora.pl. In the last few days before the tournament, Transport Minister Slawomir Nowak was racing around the country opening, nearly complete, newly restored railways stations, including Warszawa Centralana, Warszawa Wschodnia, Warszawa Zachodnia, and amazingly, Wroclaw Glowny. Even Prime Minister Donald Tusk decided that it was safe to be photographed travelling by train. Poland’s railway companies pulled out all the stops. Railway infrastructure company PKP PLK suspended track works for the duration; journey times were reduced; special trains were run. SKM in Gdansk/Gdynia/Sopot carried 40,000 fans to and from the Spain Italy match without any incident. Clean subway, but the drain covers are not in place. Photo BTWT. So why am I not jumping up and down in glee? Let’s look at the other side of the balance sheet. Rushed work is botched work as anybody who has seen Warszawa Centralna on a rainy day will know. (The completion of this communist-era flagship project was rushed so that it would be ready for Leonid Brezhnev’s 1975 visit to Warsaw.) There have been many complaints of the new train indicator boards not working properly and only time will tell how the major investments at Wroclaw Glowny and Poznan Glowny will turn out in practice. Publication of the temporarily improved timetables was delayed for far too long. For months before the championships, travel discussion forums were besieged by fans desperate for train travel information. The advice from Poland veterans was, Take a bus, take a plane, take anything, but don’t travel by train. The train data was also not available to PKP ICs ticketing systems, so advance tickets were not available. I’m now receiving reports that many PKP IC long distance football specials ran three quarters empty! Mysteriously the same problem seems not to have affected Przewozy Regionalne which operates its own ticketing system. Until the people responsible for Poland’s railways begin to understand the meaning of customer service, they will never stop the desertion of their customers to other carriers, nor carry the foreign tourists which their expensive EU-assisted projects were supposed to attract. 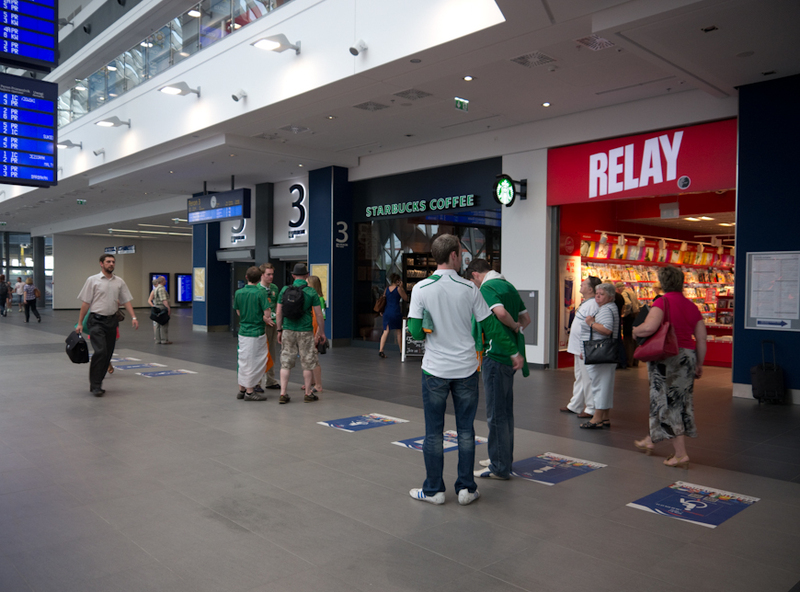 Polish media have been providing in depth coverage of the Euro 2012 football championships, and have also devoted considerable space to discussing how Poland’s roads and railways are coping with the influx of visitors. Not all the stories are flattering to Poland. Perhaps the saddest published so far, appeared yesterday on Gazeta.pl Warszawa, the Internet edition of the Gazeta Wyborcza daily’s Warsaw supplement. It seems that PKP’s brand new train indicators at Warszawa Centralna do not indicate that the Malopolska, a train from Krakow to Gdynia, actually calls at Gdansk, which is unfortunate as four of the tournament’s matches are actually being played there. Happily, one of the many hundreds of volunteers recruited for the tournament came up with a low-tech solution which is shown above. Full marks to Gazeta Wyborcza for reporting on this nonsense. Though the article pulls its punches and does not ask the obvious questions – how many millions of zloty were spent by PKP in developing a train information system that fails to provide the necessary information and who was responsible for signing off the defective system? For BTWT readers with a feeling of deja vu, yes, we covered this problem in November 2010! A fortnight ago, I attended the Rynek Kolejowy Railway Business Forum in Warsaw which had a small exhibition area outside the conference hall. The PKP Information Technology subsidiary, and the PKP Telecommunications subsidiary were both proudly displaying their wares. Afterwards, I travelled out to see the refurbishment carried out at Warszawa Wschodnia and then caught the Lodzianin train. There was some confusion at the ticket counter as to which train I wanted to catch. According to the TLK on-line timetable the Lodzianin was to leave Wschodnia at 16:58; according to PKP IC’s ticketing system it was to depart at 16:56; according to PKP Dworce Polskie’s indicator board it was due to leave at 17:03. I see we’ll be leaving five minutes late, I said to the guard. No, we’re due to leave on time at 16:58, he replied. I’ll bet you we won’t, I joked. We did not. The stupidity of breaking PKP up into so many – sometimes competing – companies was never better demonstrated. With a hat tip to Podroznik for the link. Elk Ol49-80 for sale on the Allegro auction site. Ol49-80, which had been offered for sale by PKP Nieruchomosci (PKP Estate Department), has been snapped up by a ‘businessman’ and immediately offered for sale on Allegro, the Polish rival to the eBay Internet auction site. The seller is looking for around 50,000 euro, the locomotive has a 200,000 PLN ‘Buy it now’ price tag. Also on offer is a wooden bogie covered goods van dating back to 1935. Both are at the erstwhile skansen at Elk which is being liquidated by PKP. We regard it as obscene that steam locomotives and items of historic rolling stock which have been set aside for preservation by PKP can be simply sold off like any surplus commodity with no thought to their future welfare. Moreover we are even more disgusted that when one PKP company has sought to protect its historic assets by donating them to a society that DOES care about their future another section of PKP does its best to destroy all the good work that has been done. The NRM at York are holding Railfest 2012 from 2-10 June. The event billed as Britain’s biggest ever gathering of rail record breakers will give hours of pleasure to children and adults alike during the UK half-term holiday. It is time for another BTWT quiz. Our quizzes provide us with a great deal of valuable feedback from our readers, allow us to reconnect with former contributors and provide a great deal of innocent fun. So in the spirit and style of the BBC’s Round Britain Quiz here is the first question. What links: a vessel built for a loyal celebration; a 6th century abbot; and a historic industrial steam locomotive? There are 6 points for the first correct answer. If clues are needed to solicit a correct answer, the number of points awarded will be reduced according to how much assistance has been given. Kanczuga Station, Przeworsk Railway. Photo Pabbloz. After missing the traditional beginning-of-May start of the operating season, the SKPL-operated Przeworsk Railway commenced its 2012 passenger operations on 2 and 3 June. Trains will run every Saturday and Sunday during June, July and August; departing from Przeworsk at 09:00 and arriving at Dynow at 11:45. The return working departs from Dynow at 14:30 and arrives at Przeworsk at 17:10. In addition a free-of-charge shuttle is operated in association the the restaurant at Bachorz. The shuttle departs from Dynow at 13:00 and arrives at Bachorz at 13:10. It leaves Bachorz at 13:50 and returns to Dynow at 14:00. There is just time to sample the traditional Polish kotlet schabowy (pork chop) if you order promptly! During September trains will only run on Sundays. Poor public transport integration at Lodz Kaliska. 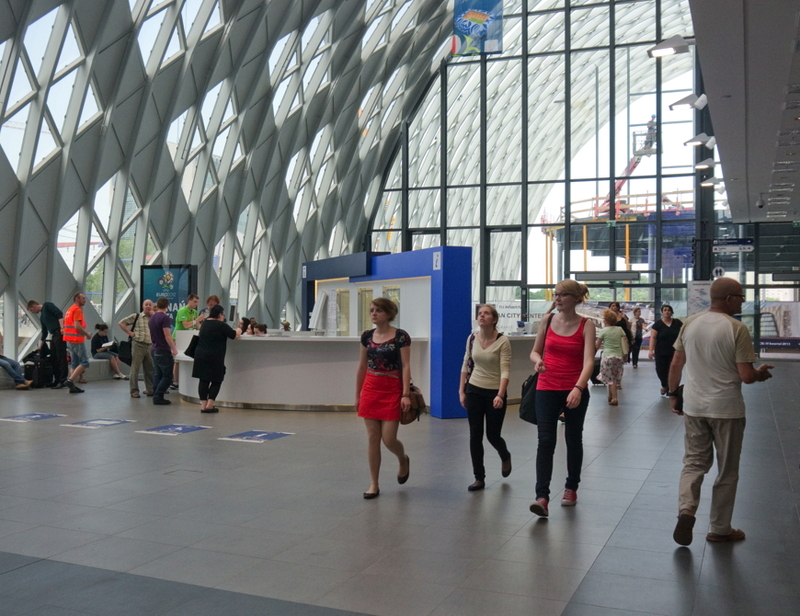 Walking distances to the station booking office from the nearest tram stops are: bkp. Bandurskiego – 250m; Lodz Kaliska Estakada – 500m. Before the station was rebuilt a tram service ran right up to the front steps of the booking office. Map courtesy OpenStreetMap. I’m sitting in my car in a traffic jam on the inner ring road in Lodz, thinking to myself, Why am I here? It’s not far to the tram stop from the flat where I’ve been staying. It’s the morning rush hour, so the journey to Lodz Kaliska would probably take no longer by tram and might actually take a few minutes less. I actually like travelling by tram! So, what on earth am I doing here? I think about this for a while and draw up a list of reasons. It’s a 500 yard walk from the tram stop to the station booking office. The tunnel that would have provided a much shorter route walking route to the station is blocked off and the tram service that used to run right up to the steps of the station is just a nostalgic memory. Because of my bad back, travelling with a heavy suitcase is always difficult; lugging it on and off the high-floored 7N trams is an extra challenge I can do without. I’m dressed in my jacket and smart trousers, it’s rush hour and quite hot. If I go by tram I’m likely to end up smelling like cabbage soup. Given the problems encountered when I explored the Lodz tram network with Chris White, I’m not sure that the tram would have got me to the station on time. I feel better. I find a fortuitous parking slot and after two attempts at reverse parking (my back is making it difficult to look behind me) I dock the car. I deduce that the Warsaw train leaves from platform 3, and climb up the appropriate steps (there are no train indicators). There’s no train either. It’s sitting across the tracks next to platform 2. I cross the tracks by the barrow crossing, the guard whistles. I call out, Prosze czekac! (Please wait!). He waits. Fast forward to the evening of the same day. I’m outside the Sobieski Hotel. The Minister emerges from a VIP reception, recognizes me, and we make small talk. He’s waiting for his official car. It approaches after a couple of minutes. He makes a dash for it, interrupting our conversation in mid-sentence. My conscience feels better. Now if only official cars were banned and the Minister and all those responsible for Poland’s railways had to travel by rail, how long would it take for Poland to have the best trains and trams integration in Europe? Former Danish MA 461-470 diesel unit on a Lubuska Kolej Regionalna working in the early 1990s. Photo Mohylek. The Wolsztyn scene underwent a big change on 23 May 1993, PKP ceased to be responsible for passenger services on two of the five lines radiating from Wolsztyn itself: those to Sulechow, and to Nowa Sol. For a few years up to that date, those two less important lines, had been the ones over which most of Wolsztyn’s steam passenger workings had operated. Passenger diagrams were re-jigged for the benefit of enthusiasts and tourists, so that a decent number of workings on the remaining passenger lines (Wolsztyn – Poznan, and Zbaszynek – Wolsztyn – Leszno) were regularly steam-worked. From the above-mentioned date, a new and strange thing came to be, concerning passenger services in the area. A new undertaking was formed, titled Lubuska Kolej Regionalna – to operate in PKP’s stead, local passenger services on a number of secondary lines in Lubuskie province (encroaching a little way into the province to the east, Wielkopolskie, in which Wolsztyn is located). 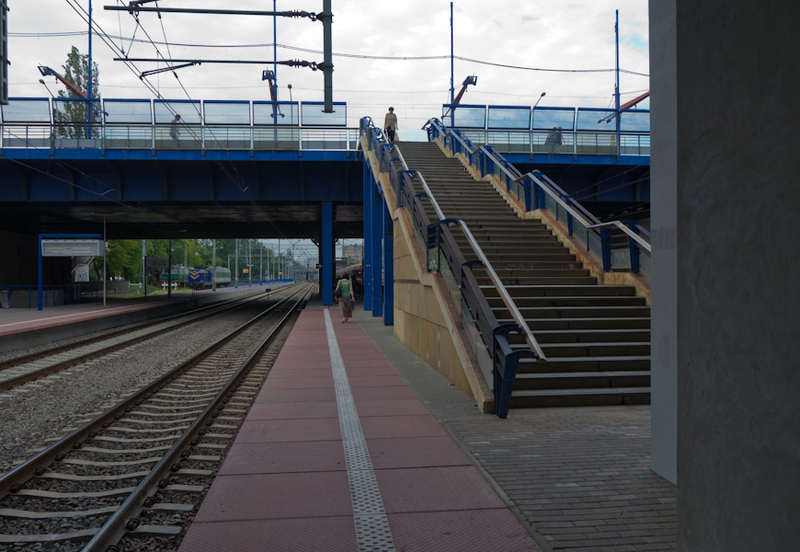 Six such lines came into operation by the new LKR: some – such as Wolsztyn to Sulechow, and to Nowa Sol – ‘seamlessly’ taken over upon PKP’s ceasing to work them; others with passenger services being restored months-or-years after PKP had closed the lines to passengers. LKR took over six lines in all: the two from Wolsztyn itself, already referred to; the Toporow – Sieniawa Lubuska section of former PKP Table 334; the Kolsko – Slawa Slaska section of former PKP Table 347; the parts of PKP Table 352 involving workings Nowa Sol – Kozuchow – Niegoslawice and return; and former PKP Table 357 Tuplice – Leknica. What LKR found, to work its services, was – of all unlikely things – several express-diesel-multiple-unit sets (four-car, I think), recently redundant from the Danish State Railways, and bought by LKR second-hand from that source. In their homeland, these units had been designated Lyntog (Lightning Train). They were based at LKR’s headquarters at Czerwiensk, whence – seven days a week — they worked remarkably complex and lengthy diagrams which managed to give an average of two or three workings each way daily, over each of the six taken-over sections. To get from HQ, to one, and then to the next, and the next, taken-over branch in order to serve them, the Lyntogs traversed still-PKP-passenger-served routes, carrying on public-passenger business on same. This way of doing things meant that in a fair few cases, LKR could not even pretend to run services at times which fitted in with people’s required travelling hours – everything had to be geared to the diesel units’ diagrams. Thus, the two daily return workings between Kolsko and Slawa Slaska all happened in the time-window approximately between 1500 and 1830 hrs. 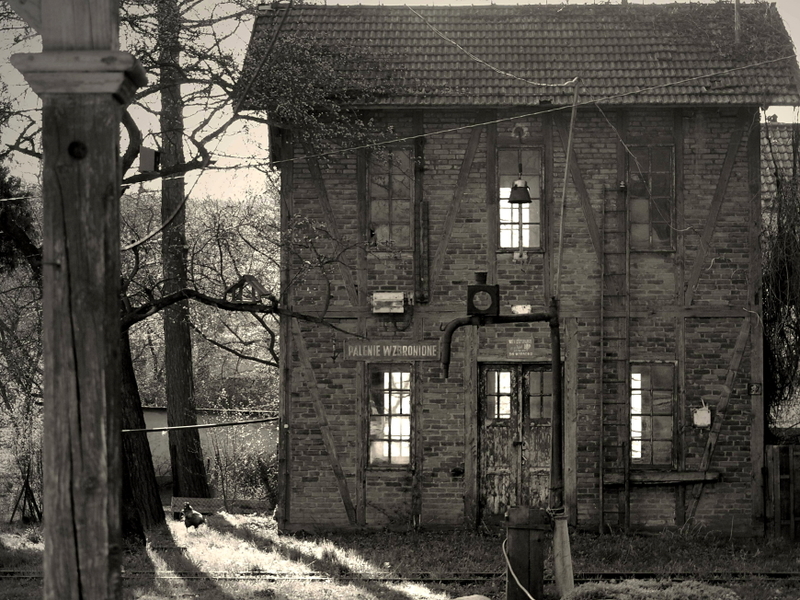 – they involved the 14:17 Wolsztyn – Nowa Sol, and the 1645 Nowa Sol – Wolsztyn, interrupting their journeys to run the 14 km from Kolsko to Slawa Slaska and back again. Ingenious all this may have been, but there was another adjective which asks to be applied to it: ‘nonsensical’. It came as no surprise to learn that as at early February 1994, the undertaking had gone bankrupt, and all its services had been withdrawn. An approximate eight-month career – mayfly-like, indeed. The LKR handled passenger services only; after 23 May 1993 PKP continued to work freight over some portions of LKR’s six lines. They did so south-west of Wolsztyn, for instance; including 11km of former Table 347 south of Slawa Slaska (thus not traversed by LKR passenger workings), to Krzepielow. In the light of the basic absurdity of the whole LKR undertaking, one has to wonder just what it was all about. It would seem – either a valiant but naïve and poorly-set-up attempt to offer a genuine public service; or something else? I don’t think it unjust to say that post-the fall of Communism, Eastern Europe has been heavily beset by a great variety of scams – some of them very strange – carried out by resourceful folk. An associate of mine (a self-confessed cynic) came up with the theory that the business with the LKR, was a racket whose perpetrators found an easy way to have handed over to them by PKP, free of charge, the stations and other associated buildings on the lines concerned. A brief spell of ‘Lewis Carroll’ passenger operation, planned so as to be totally non-viable, and speedily to fail; and after its collapse, plenty of ex-railway real estate for the perpetrators to sell off for development. I have some doubts about the veracity of this scenario: there is the consideration that it would maybe only work for sections totally relinquished by PKP: as mentioned above, PKP continued to work freight on parts of the lines concerned, and would presumably have continued to need the infrastructure for that purpose. At all events, the time which LKR and its Lyntogs spent on the public stage, was exceedingly brief.